Homeowners’ request. A more open kitchen with simple, clean lines and generous workstations. Color scheme. 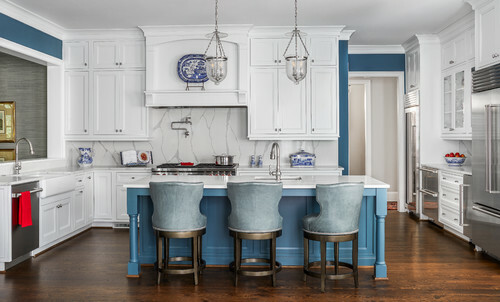 Blue wall and island paint (Tempe Star by Sherwin-Williams). White cabinet and trim paint (Bright White by Benjamin Moore). Antique blue-and-white serving platter, breadbox and pitcher. Gray-veined white quartz countertops and backsplash. Silver appliances, light fixtures, faucets and cabinet hardware.